Carrington Rotation 2198 covered the time period from 2017-12-03 1441 UT – 2017-12-30 2231 UT . As in the previous rotation, we could observe 3 Active Regions AR2690-AR2691. AR2690, just a little more than a pore, was visible on 12/7 and 12/8. AR2691 made it one day longer, and was visible for three days from 12/11 till 12/13. AR2691 was visible for 8 days and grew to a size of 160 millionths and 12 spots on 12/25, while it produced 10 B-class flares on 12/22 and 23. Active Regions were visible on 13 days, and 14 days were spot less, bringing the spotless days since solar Max at the end of the rotation to 137. The highest Wolf Number of 22 was recorded on 12/24 and 25. The highest total Active Region Area for the day of 160 millionths was recorded on 12/25. This rotation showed a little more activity with a Total Active Region Area for the Rotation of 650 millionths than the previous one. For this rotation we would like to feature three images by three of our observers, Raffaello Braga, Guilherme Grassmann, and Theo Ramakers. Thanks to them, as well as all other contributors for another great rotation. Please take a look at all the drawings/images by clicking on the link above which links to our archive for CR2198. “Tornados” on the Sun happen many times, but you need some luck to observe one, and even more luck to capture an animation. 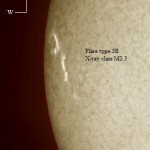 ALPO member Theo Ramakers had this luck on March 3 2011 during his normal Solar imaging session. 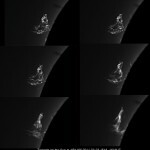 When observing a nice heart shaped prominence at the Eastern Limb, an area which were to become Active Region 1166, he noticed that the plasma was moving rapidly and changing the shape. His instinct told him to start a one hour imaging session, in which he captured 54 images between 15:18 and 16:19 UT. After processing, he built an animated gif, showing the rotation which you can see here. In order to imagine the speed at which it rotates, please note that the top of the tornado is almost 60,000 miles wide and the animation captures 1 hour of rotation. It is also interesting to note that the base of the tornado shifts during the one hour and seems to “walk” the surface of the active region. Below three images, the first one is a composite of 6 of the 54 images taken, showing the movement of the plasma, the second gives a view of the tornado against an inverted full solar disk image of the Sun, and the last one an image of NASA’s Solar Dynamics Observatory AIA camera at 304 nm, twenty minutes before the capturing of the animation images was started, and the “tornado” clearly can be seen already. Well, it is less than a week until the Mercury transit, and a group of individuals is looking forward to try, based on the parallax shown in images of the transit at the same time, when made from different locations from Earth, to calculate the distance between the Sun and Earth. In order for this to be successful they will need images made at the same time and know the exact coordinates of the location on Earth where the image was made. We are suggesting to not only submit your images of the transit, but if possible also an image of the full sun at exactly the full hour (if possible to the second because Mercury as well as the parallax are very small), so these enthusiasts will have data they can use. If you make an avi, please use the center time of the avi. In addition, the ALPO’s Transit section will use the data for an extensive report to be published at a future date in the Stolling Astronomer, the Journal of the Association of Lunar and Planetary Observers (the ALPO). 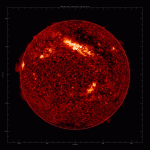 We hope that Solar imagers will consider this request, and submit all their images (also partial Sun images and close ups) attached to an email with the exact time and coordinates of the location addressed to: solarimages@alpo-astronomy.org . Carrington Rotation 2172 came to an end on January 21 2016. 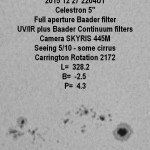 So take a look at over 100 images and observations submitted by our observers during this time period. This rotation ran from 12/25/2015 1152 UT until 01/21/2016 1958 UT. 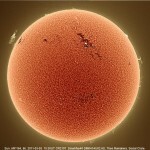 During this time the Sun showed 16 Active regions (AR2470 to AR2487) of which the largest region became AR2173. This region grew to an Fkc on the McIntosh scale with 38 spots on 12/27, and the size of the region maxed out at 590 millionths on the same date. The region also produced the largest Flare, an M2.4, which maxed out at 00:10 UT on January 2nd. Here the image of AR2173 on December 27th by Rik Hill and an image submitted by Monty Leventhal of the M2.4 flare on 2016-01-02 ten minutes after the maximum. Thanks to all contributors to this Rotation: Monty Leventhal, Tony Broxton, Gabriel Corban, Dave Tyler, Rik Hill, and Theo Ramakers.